Just outside our kayakcenter lies an archipelago of several hundred mostly uninhabited islands. 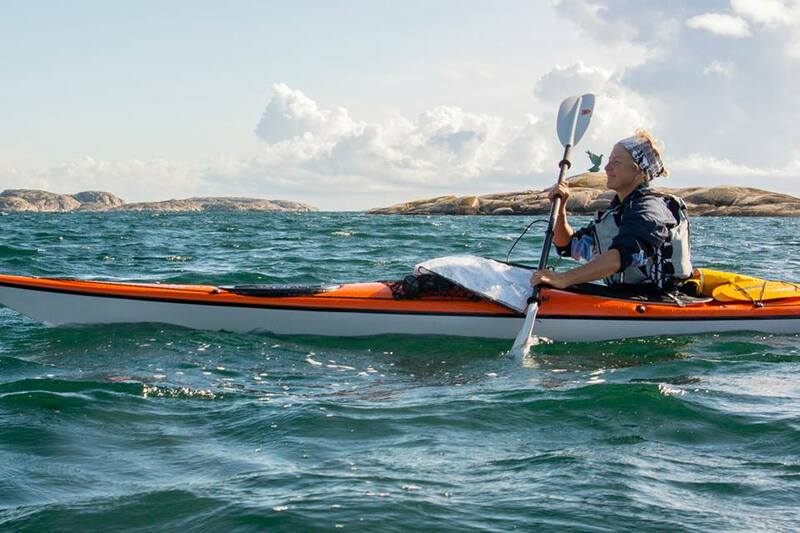 In a kayak, you have almost endless possibilities to go from north to sounth, depending on how the wind is blowing and how much time and previous paddling experience you have. On many islands, you will find cosy sand beaches or simple landings at the foot of soft grassy spaces, perfect for a picnic or an overnight in tent. When you stay in the archipelago it is of great importance that you respect the bird/seal protection areas, seal protection areas, animal & plant protecion areas and the Right of Public Access. There are special regulations for the natural reservoir such as Väderöarna and Kosterhavet National Park among others. Presented below is a suggestion of a 3-5 days route, total distance of approx. 80 km. Our suggestion means day stages averagin 20-25 kilometers, depending on how many days you choose. Plan your own tour from how long you feel comfortable paddling. Make room for spontanious changes to your plan and take into account that the weather can impact on your speed and ability to paddle. 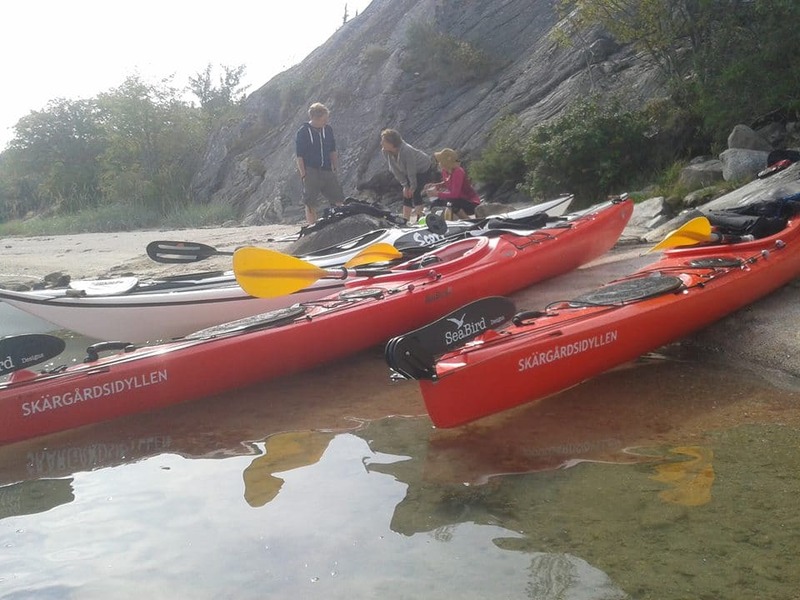 Start your tour at Skärgårdsidyllens main kayakcenter in Gröneamd, Grebbestad. 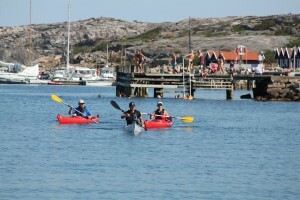 You have a wonderful day of paddling and exploring the islands outside Grönemad/Ullmekärrsand. The maze shaped islets of Håverne, Käften and the high cliffs of Gåsö where you might see youngsters take a 12 meter dive into the ocean. Heading south towards Pinnö, Klövskär where you might see both oysters and seals. We strongly suggest that you explore the nature reserve of Otterön. Otterön is a minuture size of Bohuslän, with its deciduous forest, heaths and flat rock areas. When you feel like the day is commign to end remember that camping is prohibited on this island. Head to St. Måkholmen or Musö instead for good nature tenting possibilities. If you prefer the comfort of a bed head for Tanumstrand that you will find on mainland south of Grebbestad. Be on the lookout for oysters on your journey south. The surroundings around Grebbestad are Sweden’s finast waters for oysters, where 80% of the country’s crop is picked and taste the very best. But if you find any, strain yourself. The oyesters belongs to the property owner and picking without permission is prohibited. If you would like to taste the local oysters visit the fish market or the local restaurants that serve plenty of oysters and seafood. 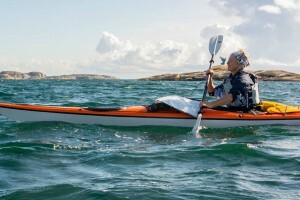 Continue south, paddle past Danholmnen and admire the house that defiantly gases out towards the sea from cliffs at the southern part of the island. The Swedish film star Ingrid Bergman lived here when she wanted to get away from the spotlight and enjoy the nature and ocean. Aim west, if the wind permits, and spend the night nature camping at Långeskär. This is a wonderful place to set your tent and enjoy the afternoon light. 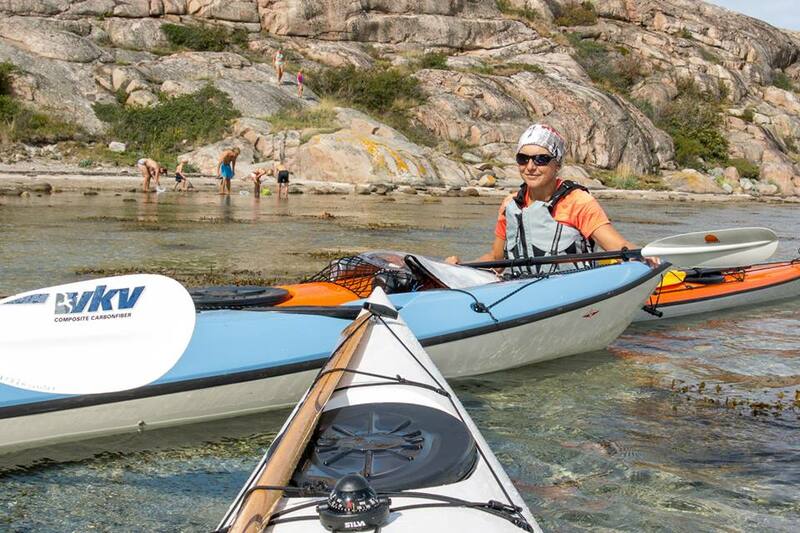 Today you will have a chance to explore that granite formations near Bogen, the protected basin near Gluppö Island, and the picturesque settlements on Fläskö and Dyngö islands. The small building on the top of Dyngö Island, a pilot lookout seen from all directions in the archipelago, is a good spot to get your bearings from the kayak. It is easy to get lost if you don’t pay attention, there are plenty of beautiful island and islets to get distracted by. You can paddle around here for a long time and be fascinated by the islands and life in the water. When you think it’s time, aim for the relatively large Valö Island, justoutside Fjällbacka, where you can find accommodation and food at the Valö B&B. Do yet another tour south. The archipelago is just as stunningly beautiful as yesterday. 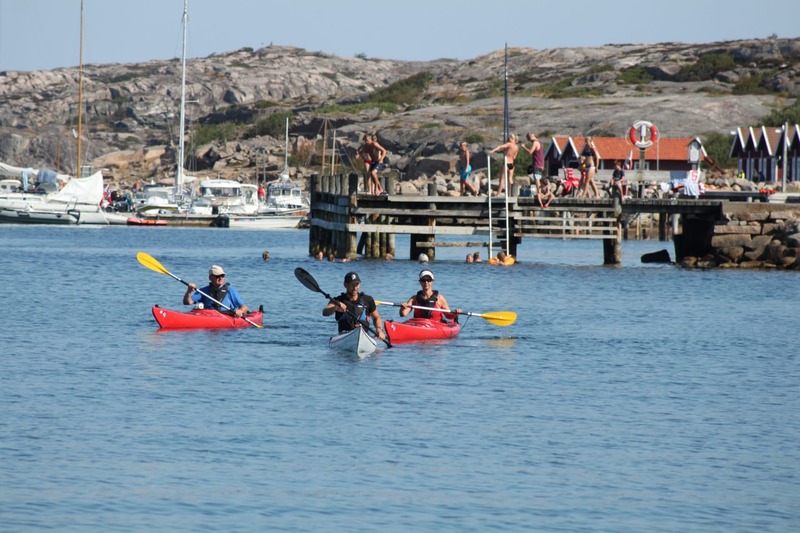 Don’t miss the historical captains villas on Hjärterö and Florö islands, the enchanting settlements on Kalvö and Korsö islands, the remarkable little war cemetary at Stensholmen or the beautiful, inviting small sand beaches as Vedholmen, Trinisla or Getryggen. Glide little by the ashore in Fjällbacka for a late lunch or a good coffe. A table at Retaturant Bryggan vill give you about as much of a Swedish summer feeling as you can find. 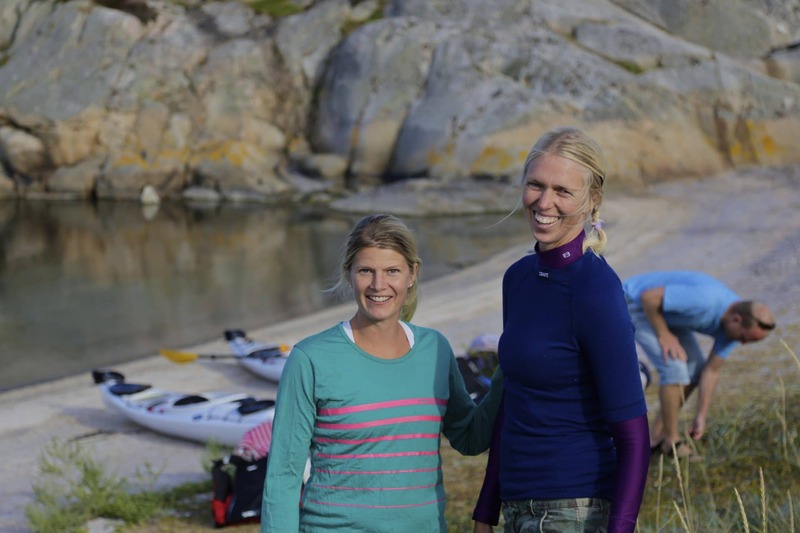 When the delicious lunch has settled in, you will have energy for an afternoon paddle back to where you started – Skärgårdsidyllen Grönemad/Ullmekärrsand northwest of Grebbestad. 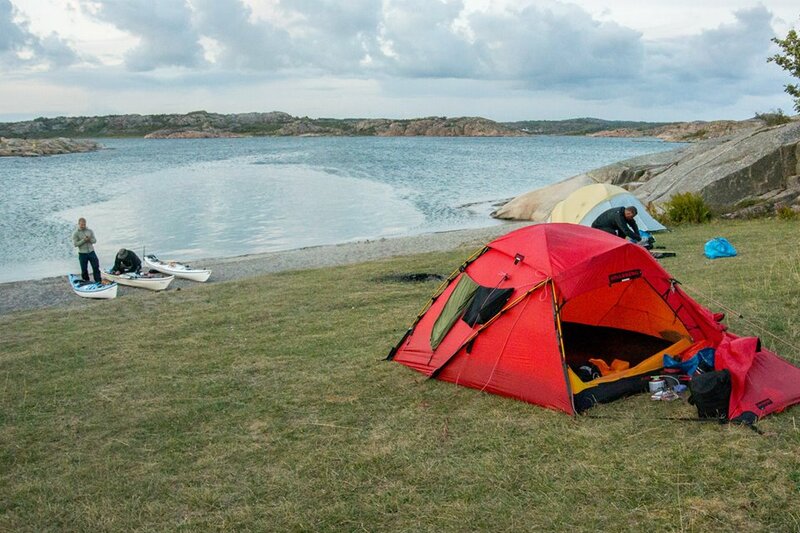 If you would like to spend one last night camping on the islands before mainland we suggest that you spend the night on the Island named Käften just outside Skärgårdsidyllens kayakcenter. If the weather permits you now have time to explore the coastline stretching north from Ullmekärrsand/Grönemad towards Havstensund. On the mainland you will pass the Altarstone, Munk caves before reaching Edsvik and the nature reserve named Tjurpannan (bulls head). Tjurpannan is one of the coast’s most weather exposed routes, where the waves can be big and difficult. Ensure that you paddle this passage in relation to your own comfort level. 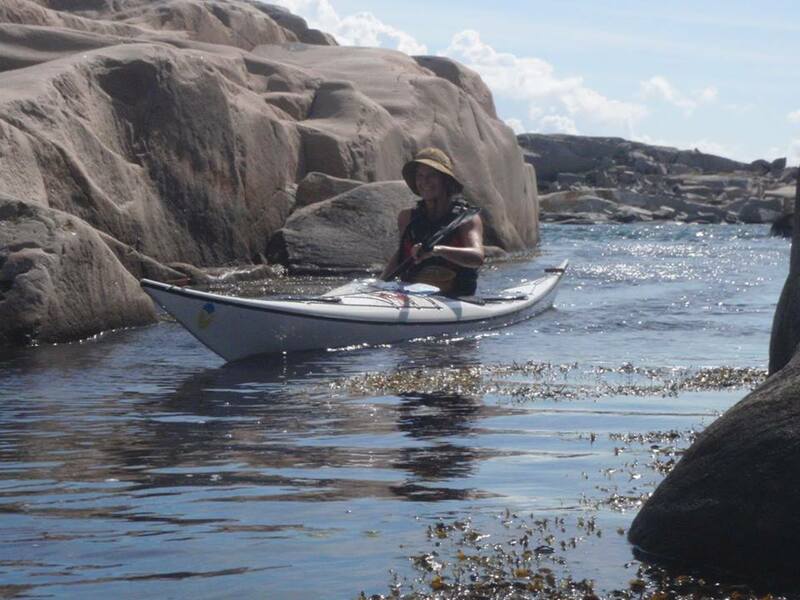 On a calm day you can stay close to mainland and take a close look on the granite rocks, sheds and boathouses. If you would like to get an ice-cream of take a stroll in a picturesque village we suggest that you stop by Havsstensund. This is also a great place to get a magnificent view of the area. Head up towards the path Målarklöva which leads you through and up the mountain above the small beach. From here you can spot the inlet to Havstensund and the Weather Islands on a clear day. You will find a good nature camping spot on the Island just south of Havstensund namely the Islands Ulsholmen or Långeskär. If you prefer the comfort of an bed head north for Resö Old School.